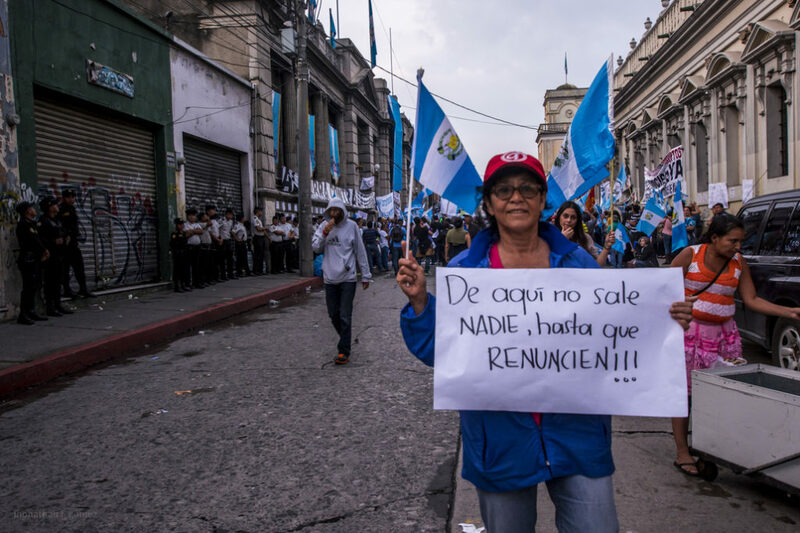 Guatemalans protest holding signs that read, "Neither left nor right, I am Guatemalan and I support the fight against corruption." All photos by Jhonathan F. Gómez. 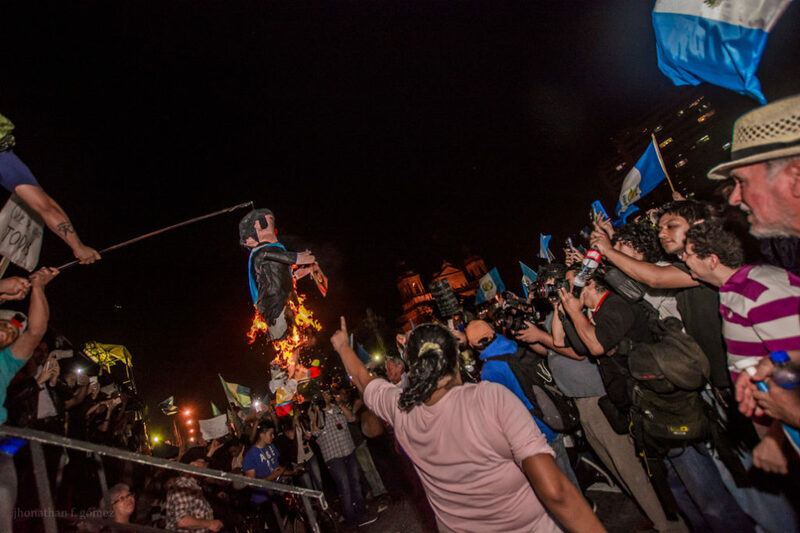 After three weeks of continuous protest, Guatemalans saw Independence Day not just as a typical holiday to celebrate on Sept. 15, but as an opportunity to express their indignation nonviolently in the streets and demand President Jimmy Morales – as well as his 107 accomplices in Congress who attempted to pass a bill that would have institutionalized corruption – put a stop to impunity. If these laws had taken effect, they would have caused further damage to the rule of law and exacerbated the the country’s political crisis. Due to pressure from various sectors, a ruling by the Constitutional Court as well as public outcry marked by several peaceful protests, Congress repealed the bill. However, anger and indignation filled the streets as thousands of protesters, led by university students, surrounded the five entrances to Congress stating that they would not allow any lawmakers to leave the building unless they resigned. Tension grew as members of Congress demanded Morales act on their behalf and the night concluded with violence. At 11 p.m. local time, riot police used pepper spray and tear gas against the protesters in order to evacuate members of Congress. 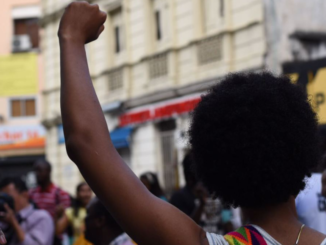 The Morales administration’s orders to repress the protests has fueled more actions from various groups across the country. San Carlos’ University Student Association (AEU), the collective #JusticiaYa, and community and human rights organizations have called for a national strike on Sept. 20. 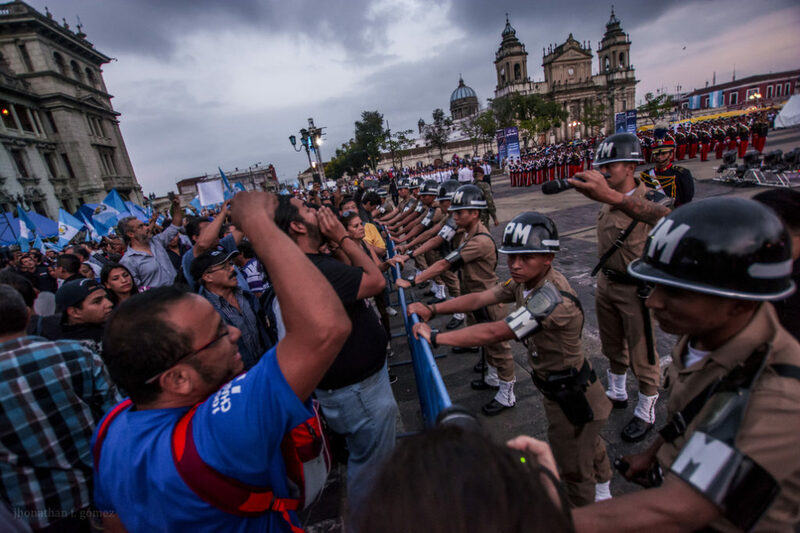 Many view the events of the last few weeks as a parallel to the protests of 2015 that pushed the then-president, retired army general Otto Pérez Molina, to resign. Although recent events are distinct, they’re not completely independent of the 2015 crisis. Pérez Molina and Vice President Roxanna Baldetti were accused of corruption and of belonging to a criminal network dubbed La Linea. The complex customs fraud case involved many politicians as well as the Tax Administration Superintendency (SAT). Pérez Molina and Baldetti are still in jail, awaiting trial. 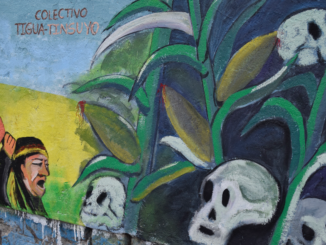 The Public Prosecutor’s Office and the United Nations’ International Commission against Impunity in Guatemala (CICIG) jointly dug up and brought the case to light. 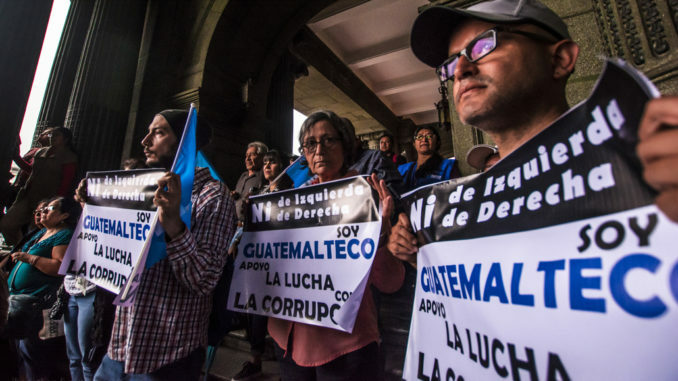 Thousands of Guatemalans expressed indignation over the high-level corruption and took to the streets every week for months. After Pérez Molina resigned, human rights organizations warned that elections should not take place without electoral reforms. 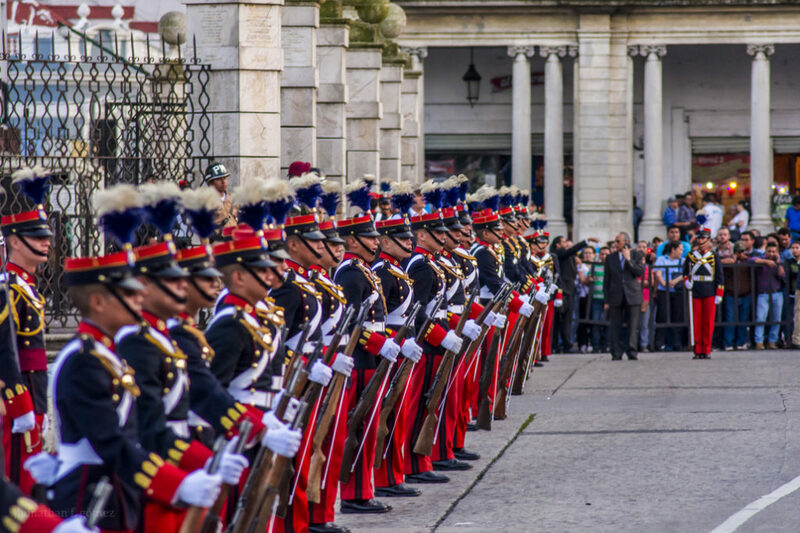 FCN-Nación, a political party with several members under investigation for various offenses and backed by retired military officials connected to civil war-era crimes, took advantage of the crisis and propelled Jimmy Morales to the presidency in 2015. 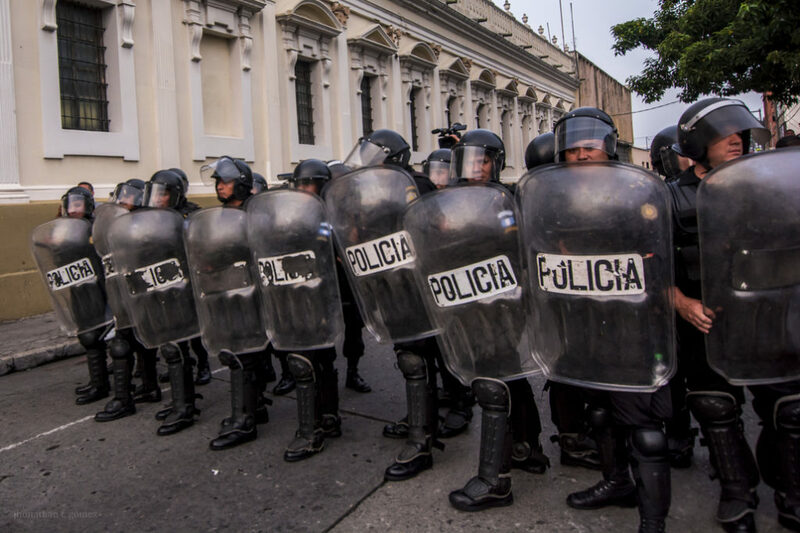 Guatemala’s Constitution guarantees the right to protest. Article 45 states, “The opposition of the people to protect and defend the rights and guarantees granted in the Constitution is legitimate.” The people have a constitutional right to peacefully protest. The Public Prosecutor’s Office directed by Attorney General Thelma Aldana and the CICIG, headed by Commissioner Iván Velasquez, once again jointly brought an investigation against Morales and his political party FCN-Nación for money laundering and illicit campaign financing, and solicited the removal of immunity so he could stand trial. The investigation suggests that $825,000 in campaign financing for his 2015 campaign were hidden. 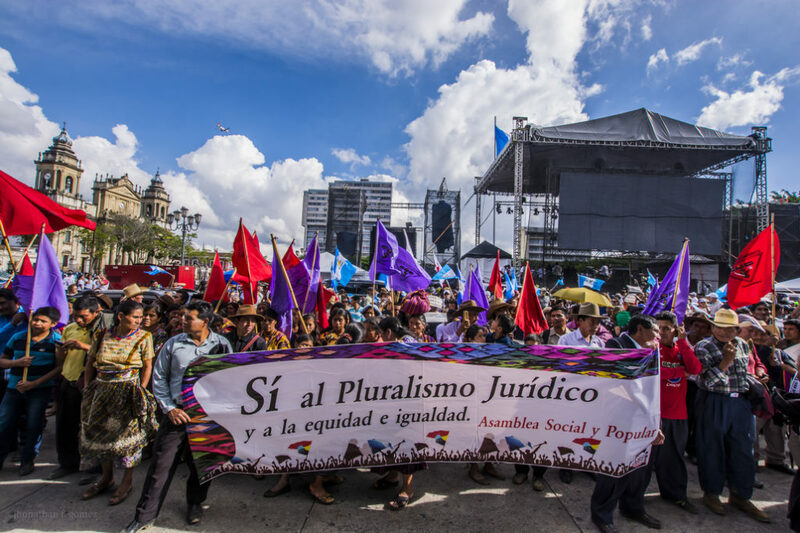 Thousands of people took to the streets as Indigenous and farmworker organizations, community and human rights organizations, and university students peacefully gathered to protest in Guatemala City’s central park plaza in support of Commissioner Iván Velazquez. Conversely, an evangelical music concert was scheduled the same day. Community and human rights organizations petitioned for the concert to be rescheduled but the request was denied. Many people at the concert held signs in support of the president. 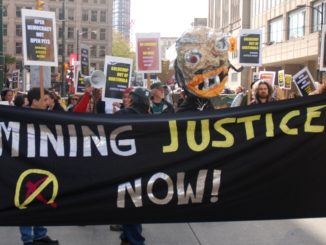 The collective #JusticiaYa filed an injunction as legal recourse before the Constitutional Court in order to prevent Morales from taking any actions against the CICIG commissioner. At 7:02 a.m. local time, Morales posted a video on his Twitter account accusing Commissioner Iván Velasquez of exceeding his mandate. 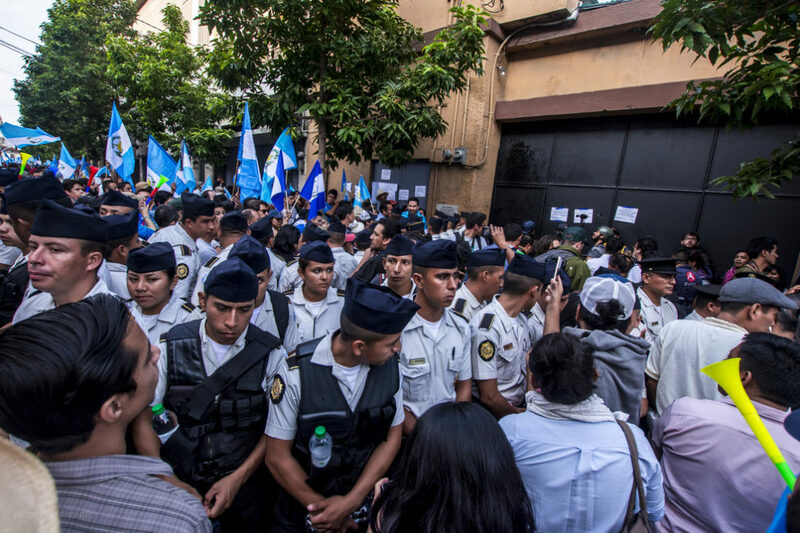 Citing the Constitution and speaking on behalf of the people of Guatemala, he declared the commissioner a “persona non grata” and ordered him to leave the country immediately. The president also fired Foreign Minister Carlos Raúl Morales for not expelling the commissioner. These actions also prompted the resignation of various ministers who criticized the decision. There was an immediate response from community and human rights organizations, as well as representatives from the international community. That same day the Constitutional Court, presided over by Francisco de Mata Vela, issued a temporary injunction suspending Morales’ order to expel Iván Velasquez. The president remained silent after the ruling, causing insecurity and speculation that a state of siege would be declared in fear of protests. In the afternoon, Morales made a statement criticizing the court’s ruling and reiterating that the commissioner had exceeded his functions by interfering in the country’s affairs, citing article 41 of the Vienna Convention. This was a clear an act of defiance to the ruling by the Constitutional Court. By the afternoon, word had spread through social media that people would gather for protests at central park plaza, as well as outside of the CICIG building. Outside of the CICIG, right-wing, pro-military groups who oppose Iván Velasquez and support President Morales gathered first. Human rights observers were called. People in support of the commissioner arrived in a small groups and the two groups stood opposite of each other, constantly shouting slogans and waving their signs. When the police arrived, a human barrier was created to separate the groups. National and international human rights observers joined the human barrier and asked the police to double the amount of officers out of fear of a violent provocation by hate groups. As time passed, the tension lessened and more people in support of the Commissioner arrived and supporters of the president, seeing that they were a smaller crowd, dissipated. The night ended peacefully with singing and dancing to the sounds of drums and horns. The Supreme Court reviewed four cases calling for removal of President Morales’ immunity. The case filed by the Public Prosecutor’s Office and the CICIG was accepted. The next step was for Congress to form a special commission in order to determine if it will vote on the removal of Morales’ immunity. Congress formed a five member randomly chosen commission whose job is to submit a report, which would decide whether or not it would recommend to Congress as a whole to vote to remove the president’s immunity. The commission had five days to submit the report. The special commission recommended that Congress vote to remove Morales’ immunity. Prior to its decision, the commission held hearings for all parties implicated, including the Public Prosecutors Office, the CICIG and the president. Congress voted 104 to 25 in favor of Morales maintaining his immunity. Protest followed. #MiércolesNegro (#BlackWednesday) was the phrase many used to describe the actions taken by Congress on this day. 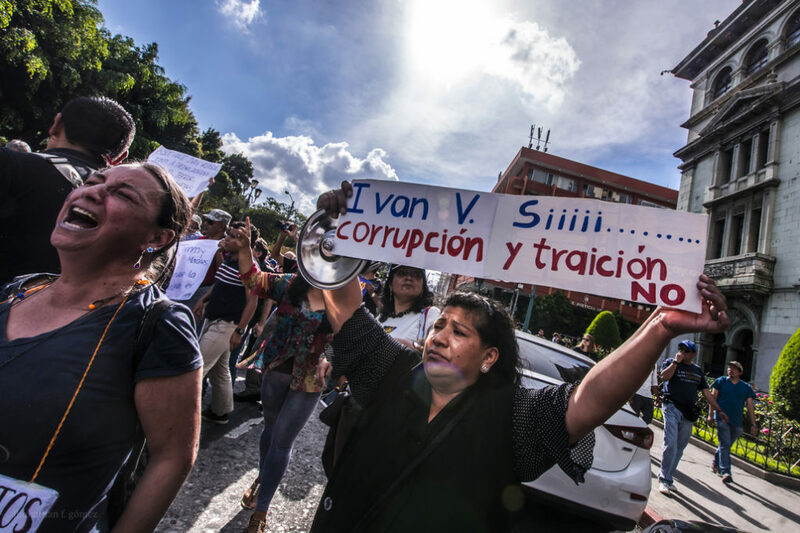 Having angered the country with its failure to strip away Morales’ immunity, Congress decided to propose a bill, which could have altered the penal code on crimes of illicit campaign financing. The proposed reforms would have shifted financial responsibilities from party secretaries to the party’s accountants, giving Morales and many members of Congress total immunity under the current investigation by the Public Prosecutors Office and the CICIG. The bill passed 107 to 16. Outside the walls of Congress, thousands gathered to protest what they slammed as an illegal and unconstitutional bill. Many protesters stayed until the later hours of the night. Traditionally, civic celebrations take place across the country in the week of Independence Day. 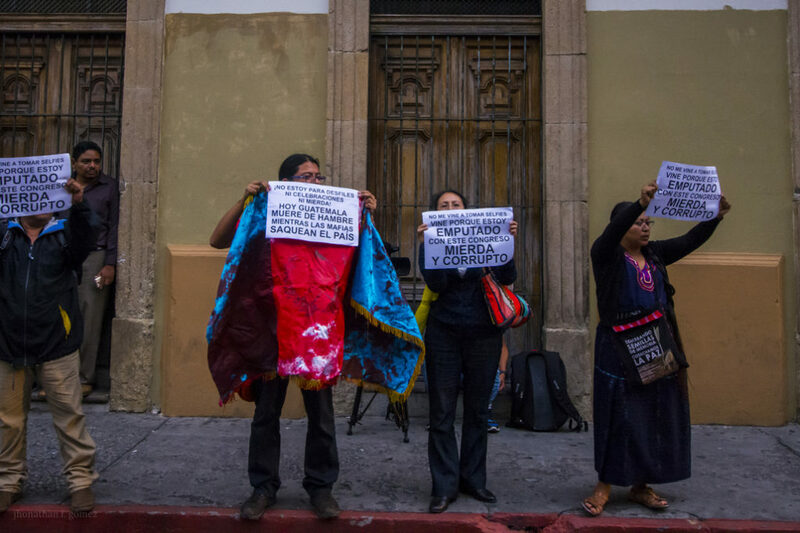 However, the actions that took place on #BlackWednesday infuriated an already indignant Guatemala and groups once again called for gatherings in front of Congress and the central park plaza. Because of the time of year, the plaza was occupied, decorated and fenced-off for the celebration of the Te Deum, a special Catholic celebration that takes place during these days. Only the press, government officials, and special guest could cross the metal fences that enclosed the plaza. Surrounding the cathedral and in the center were military police, special military forces, ordinary police, and cadets. Near the end of the Te Deum celebration, the group of protesters that gathered outside of Congress made their way to the plaza. 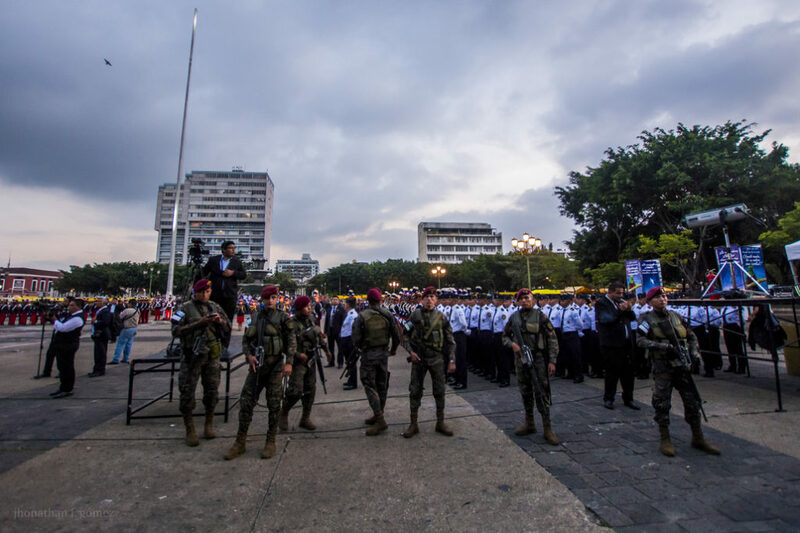 Seeing the overwhelming number of military and police, they demanded access to the plaza in order to protest. Access was denied. Students crossed the iron fences surrounding the plaza and rushed to the center, climbed the stage that was reserved for the president and special guests and began to occupy the plaza in large numbers. Security tried to contain the perimeter but eventually protesters overran the plaza. After tense moments, the police and the military left the plaza. Near the end of the evening, riot police arrived but never acted. The day ended with the Constitutional Court stepping in and temporarily suspending the bill approved by Congress on #BlackWednesday. 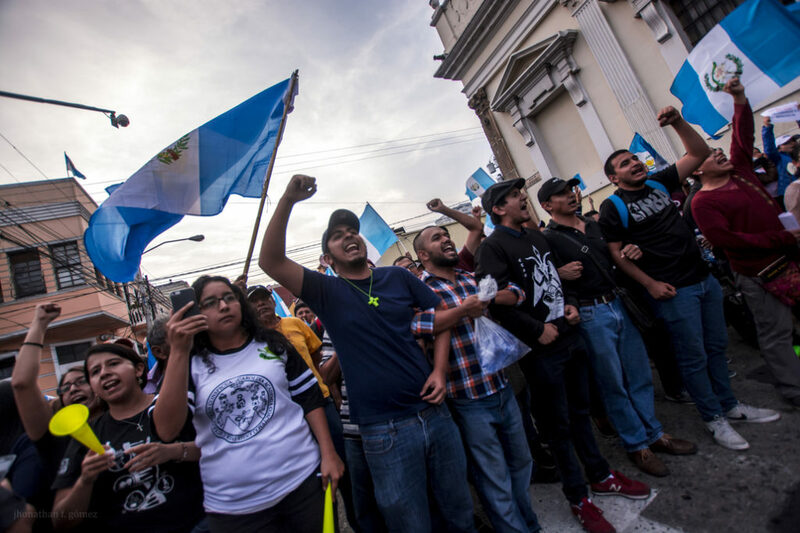 After the events of the Sept. 14, more protest were scheduled to take place in Guatemala City, Quetzaltenango, Zacapa, Chiquimula, Petén, and Antigua. The president and the corporate media labeled the protests on Thursday as violent and accused the protesters of endangering the families that were present. Congress scheduled an extraordinary session to discuss the bill that had been approved two days earlier, with 130 of 158 members voting to repeal the bill. Congress believed its job was finished. Outside, university students led thousands of protesters to surround the five entrances to the building, demanding the resignation of all 107 members of Congress who voted for the bill legislating impunity. As the day passed, more people gathered outside Congress, preventing its members from leaving. Nevertheless, the message was clear and uncompromising: they would be allowed to leave if they resigned. Through the weeks of nonviolent peaceful protests, agitators and infiltrators who wanted to promote violence were identified. Yet on this particular day, violence seemed inevitable as the police presence increased and riot police arrived. The protesters were pepper sprayed and tear gassed in order to evacuate members of Congress. It was a detriment to democracy in Guatemala. Yet people are not scared, many express that what started in 2015, will have its end in 2017. 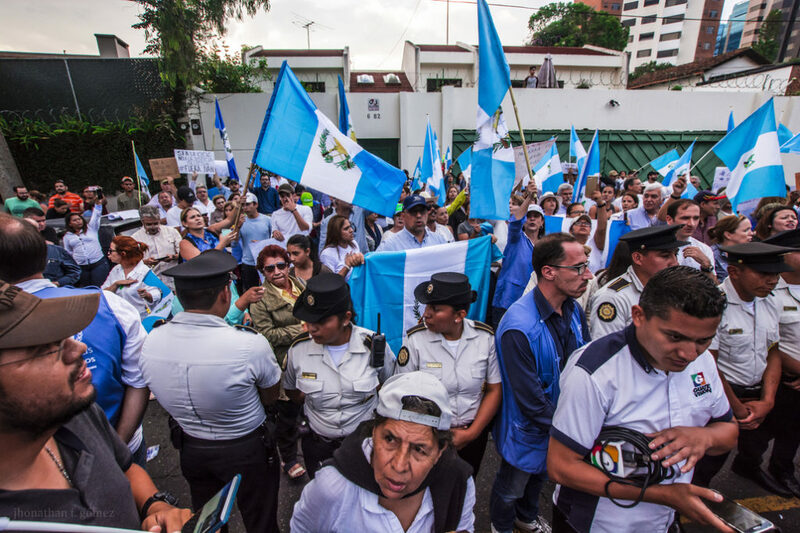 People are more informed and as the country prepares for a national strike on Sept. 20, thousands are expected to fill Guatemala City’s central park square. 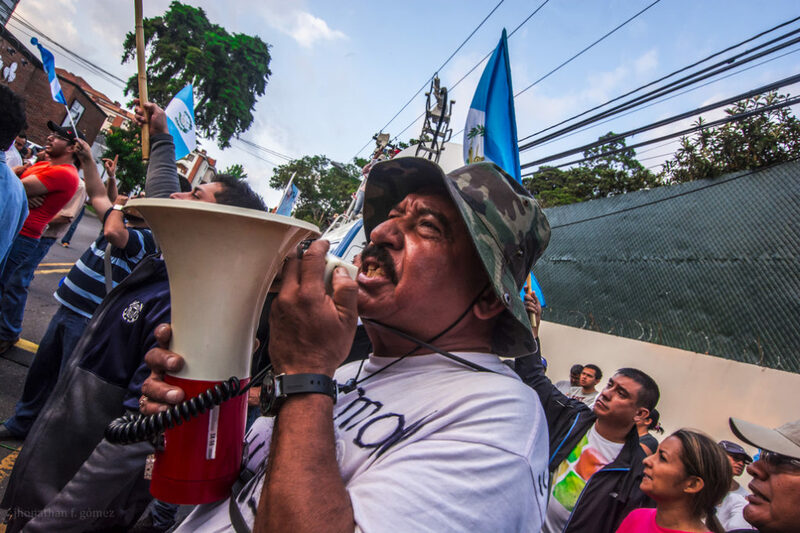 The people of Guatemala are writing a new history, today.